In the US, most social networks see a spike in shares during the morning hours. Shares in this case don’t refer to shares on Facebook or retweets on Twitter – instead, these shares refer to content being shared to a specific social network from its original digital source through sharing tools (e.g. share to Facebook, share to Twitter). This trend is especially true for Twitter and LinkedIn, which are sites that tend to attract early birds. Shares to Facebook get started a bit later in the day, and shares to Pinterest happen mostly at night. With shares occurring earlier in the day, clicks tend to happen a little later across all social networks, mostly in the late afternoon and into the evening. Twitter and LinkedIn get the most clicks in the afternoon, while Facebook and Pinterest drive traffic after 8:00pm. While each social network has peak times of day for shares and clicks, they also have certain days of the week during which engagement spikes. When you put all that data together, you get specific timeframes for which you should aim to post content for maximum shares and clicks. Users rest on the weekend, and so can you. Since demand for content isn’t as high on Saturdays and Sundays, save your best content to be published during the 9-5 workday between Monday and Thursday. Sharing and clicking activity tends to die down on Saturday and Sunday across all platforms…except on Pinterest. In fact, some of the highest click activity on content shared to Pinterest occurs on Sunday night from 9:00-10:00! Note that users aren’t as willing to share content on Sundays, but there is definitely a demand to see new pins. Unlike in the US, where clicking tends to happen much later than sharing, in the UK, sharing and clicking tend to happen within the same time period. This could be due to the fact that “Britons are slightly less digitally obsessed” or that social networks are blocked at many U.K. companies, resulting in less time spent on social networks overall, and less time spent during work hours. Much of the social activity in the UK occurs between 8:00-10:00pm GMT. The UK data is similar to the US when it comes to Twitter and LinkedIn (shares to these networks occur in the morning), as well as Pinterest (shares happen at night). The wild card here is Facebook. While users in the US tend to share to Facebook in the late morning and early afternoon, in the UK, that activity happens at night, from 8:00-10:00pm. Like social media users in the US, those in the UK are spending less time engaging with social media during the weekends. 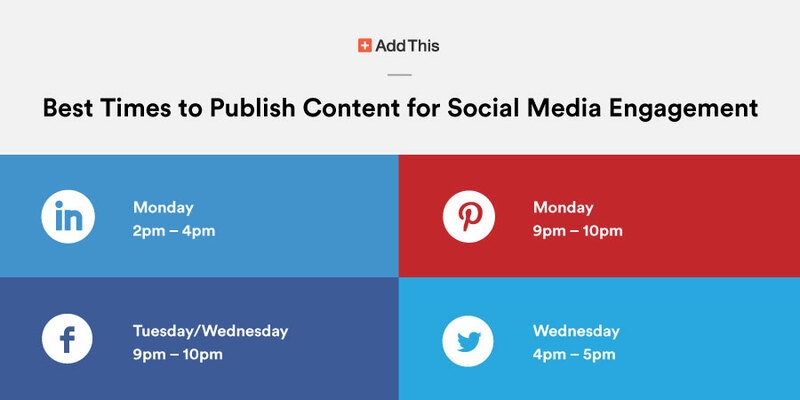 However, the exception is Sunday nights for Pinterest users, when sharing content tends to spike on this platform. Use this data as a starting point to get to know your audience’s habits. You may find that – based on their gender, life stage or interests – they’re on a different schedule. With AddThis Social Sharing Tools, you can make it easy for visitors to share your content, as well as get in-depth analytics about how and when they’re engaging with your brand across different social networks. Get started!